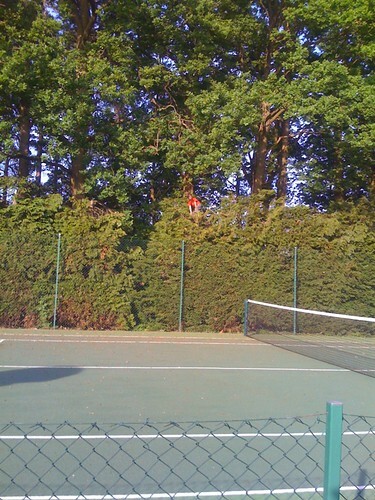 If you look carefully you can see a little red person. That's young son, perched on a branch. The Health and Safety regulations concerning children in this country are going totally overboard. In young son’s previous school, a Church of England state primary, we were already shocked by the number of rules they had, supposedly for the children’s safety. No playing football in breaks, during the heatwave they had to stay inside or sit down under the trees in all breaks, when we had the snow last year the school was closed for a whole week (explanation was that there was ice on the parking lot…) and teachers cannot hug or cuddle a child who’s unhappy or has been hurt. Then there’s this horrible story about a dinner lady who got sacked for telling parents the truth about their daughter being bullied. And there’s this silly, silly new regulations at a playground: To accompany your child or grandchild or whatever into this playground you have to be vetted as a “playground worker”. If you’re not, you have to stay outside the fence. And there’s this, where home baked cakes for school fetes have now been forbidden for hygiene reasons. In yesterday’s Times, Jenni Russell tells another horror story and concludes that we, as parents in the UK, must really do something and protest! Unfortunately, since I’ve moved my child away from the English school system to an international school, I don’t have much of a say in the matter. It’s my son’s good fortune that I’ve done so, the International school doesn’t appear to harbour these hysterical views on safety and believe that some good old-fashioned common sense and respect for teachers, children and their parents goes a long way in keeping our beloved little ones safe. However, it’s not all the government’s fault. We, as parents, must also look at our own views on safety. Where does good common sense end and over-cautiousness begin? Obviously, you can’t let your child play in the road, so that it will learn road safety. But you can let them fiddle with scissors and cut themselves a bit to understand why scissors are not toys? And where you can’t let a child stick its head into the fireplace, maybe you can let it light the candles on the table and burn their fingers a bit? I remember an incident in my son’s preschool. He fell off the climbing structure and hit his head on one of the milk crates they used in their play. He of course hurt himself and had to have a few stitches at the doctor’s office. But a mum came up to me the next day and asked whether I didn’t think we had to pull the climbing structure or at least get rid of the milk crates, so a similar accident wouldn’t happen to another child. And she reminded me that a boy had fallen off the structure the previous year and broken his leg. She was rather surprised when I didn’t agree! It was the same mother who decided that her son could never again ride in a bus after she read about a tragic accident when a child was killed when a bus collided with a tractor. No number of statistics about children’s safety in cars versus buses could convince her to change her mind! So now, let’s be sensible. If we let our children play and cycle and climb trees, there’s a good chance that they’ll scrape a knee, bump their heads or break an arm. But when I was young, we all had accidents like that! The only two real accidents, one fatal, I remember from school was a girl who was killed in traffic and another girl who got her finger crushed in a door, indirectly because of bullying. Neither of those episodes could have been prevented by all the crazy measures we take nowadays to protect our children!